This is the first time I’ve tried something like this, so I guess it is an experiment on my part. Carla is the person that brought this meme to my attention, so I thought I would give it a try. You can go directly to Sunday Sunrise/Sunset by clicking on the logo above or by clicking HERE. At the website you can find links to other sunrise/sunset photos. This picture is one that I took last November from Mt. Nebo State Park in Arkansas. 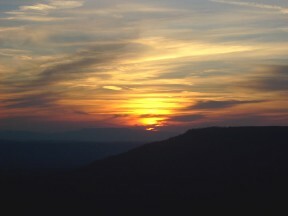 Sunset from Mt. Nebo, Arkansas. November, 2007. I chose this picture because I like it and because Betsy and I are going back there this week. Betsy has been going to Mt. Nebo for longer than she has known me, but she took me there for the first time in November, 2006. This trip will be our fourth. We always stay in a beautiful cabin on top of the mountain where we can enjoy the mountain views and the sunsets. Up there on that mountaintop it is almost always quiet and it is easy to enjoy the beauty and grandeur of God’s creation. We’ll be gone for almost a week, but we should get home sometime Friday evening. In the meantime I hope you all have a very good week. Today I finished putting the roses to bed for the winter. We’ve had enough cold weather that they’ve gone dormant and I covered them to help them get through the winter. To say that I cover the roses is not completely accurate. What I do is mound compost over the crowns to keep them from freezing. I have a compost pile on the edge of the rough behind our house to which I add grass clippings, leaves, and other organic material. 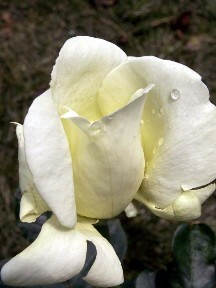 I know it’s just my imagination, but the days seem more dreary once the roses have been pruned and covered. I guess that means that winter is almost here. But hopefully when spring returns the roses will green up and start growing again. I posted the rose above as a reminder that spring will return. That rose is Sweet Freedom, a new rose for us in 2008. George at Greenbrier Creek, November 3, 2008. 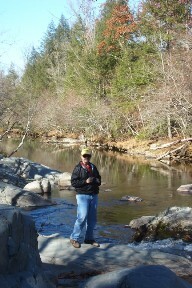 I’ve mentioned before that Betsy and I went to Cosby in early November to belatedly celebrate Betsy’s birthday. I finally got a photo page put together with which to share our memories. We rented a cabin for three nights, and since we went in November rather than August, we practically had the place to ourselves. The cabins on either side of ours were empty. When we planned our trip we hoped to do some hiking and waterfalling, but although we got some hiking in, we did not see much in the way of water in waterfalls. Our drought has been just too severe. We found Noisy Creek Cascade, but there was almost no water in the creek. We did find a couple of surprises, however. For the past three years three of Betsy’s grandchildren (two from Texas and one from Florida) have spent a day in the Smokies near Greenbrier campground. We’ve seen pictures and video of them playing in the creek and we found the spot they visited — Greenbrier Cascades. Although there was water in that creek, both Betsy and I resisted the temptation to go swimming or tubing (it was just a little cool!!). But the nicest surprise was at Serenity Falls. There was a little water coming over that falls, but there were also three rental cabins on the creek. One of the cabins was at the very base of the falls with a deck that extended over the creek. It didn’t take us long to decide that we wanted to go back there in the early spring and spend at least one night in that cabin. Although our outdoor activities didn’t go exactly as planned, our stay was very relaxing and enjoyable. To see more of our Cosby trip click HERE. 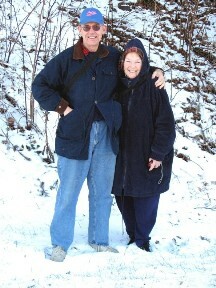 With my beautiful bride at Newfound Gap, December, 2007. I have so much to be thankful for — a beautiful wife to share my life and the ability to hike and enjoy the beauty of God’s world (and yes, that even includes snow!). It’s hard to put into words all for which I should be thankful. Perhaps the following prayer from the Book of Common Prayer best describes how I should approach this and every other day. Accept, O Lord, our thanks and praise for all that you have done for us. We thank you for the splendor of the whole creation, for the beauty of this world, for the wonder of life, and for the mystery of love. We thank you for setting us at tasks which demand our best efforts, and for leading us to accomplishments which satisfy and delight us. Above all, we thank you for your Son Jesus Christ; for the truth of his Word and the example of his life; for his steadfast obedience, by which he overcame temptation; for his dying, through which he overcame death; and for his rising to life again, in which we are raised to the life of your kingdom. Grant us the gift of your Spirit, that we may know him and make him known; and through him, at all times and in all places, may give thanks to you in all things. Amen. I mentioned on Saturday that we lost electricity in our computer room Friday night. Even after unplugging everything from the outlets the circuit breaker kept tripping. Betsy’s creativity with extension cords kept us online, but we knew we had to get the problem fixed. We just hoped the repair wouldn’t be too extensive or too expensive. The circuit that failed is strange — it includes the outlets and ceiling light in the computer room, a mirror light in a bath room, and a lamppost light in the front yard. I suspected that the problem might be related to the front yard light which hadn’t worked for a couple of years. When the electrician arrived he quickly determined that we had a dead short someplace along the circuit. The wiring in the lamppost was properly tied off and insulated. 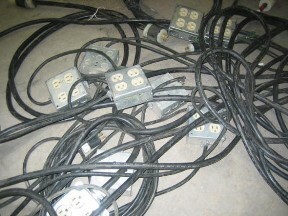 It was possible the problem could be along the buried wire leading to the lamppost or in the walls of the room. How could we find it? While we were talking the electrician pointed to a switch and asked what it was. We had to think for a moment but replied that it was a switch to the yard light. 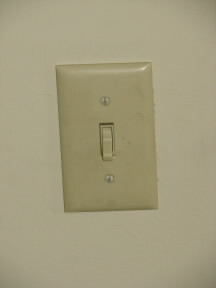 The switch position indicated that the light was off, but the electrician tested it and the switch was on! He flipped the switch, reset the circuit breaker, and we had power in the computer room! Duh! To prevent a recurrence we had the electrician completely disable the switch. We’ll put a solar light on the lamppost. Picking up leaves on Druid Hills golf course. November 24, 2008. Last week I mentioned a couple of times that Betsy and I were working hard to get the leaves out of our yard. We really wanted to get the yard cleared before the weekend, but we didn’t quite make it. We were, however, able to finish up Saturday and Sunday. It turned out we got everything done in time. It rained here in the Glade yesterday (Monday), but we were surprised to hear the noise of equipment getting louder and louder. At first we thought it was something coming up the hill in front of the house, but when I looked the road was empty. I then looked out back and saw the two tractors pictured above. 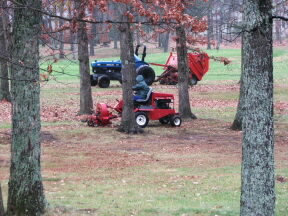 In spite of the rain the maintenance department was out picking up leaves from the golf course. (I guess that made sense since there weren’t any golfers!) And what we appreciated the most is that they picked up the leaves in the rough between our back yard and the fairway. And since that is where we put many of the leaves from our yard, we were delighted. I hasten to add that we aren’t being given special favors. Having leaves we put in the rough picked up is a ‘perk’ of having a golf course home. And we sure do appreciate that ‘perk’. If only I could get them to come to the front of our house with their equipment! 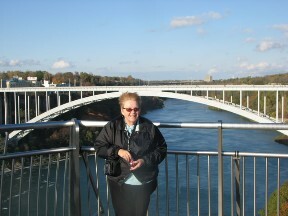 Betsy at Niagara Falls with the Rainbow Bridge in the background. Betsy and I first went to Niagara Falls in 2002. At that time we were on the Canadian side of the river. We actually stayed at Fort Erie, Canada, and drove along the river each day to the falls or beyond. We of course saw the American Falls from the Canadian side several times. We did spend part of one day at the state park on the American side, but it was a hurried visit. When we were in Buffalo visiting Kelly and Chuck last month we went back to the state park. It was late in the afternoon when we got there, but we did have time to walk down to the falls and along the river. The day had been rainy and it was still quite windy when we got to the falls. But the power of the falls was obvious and very awe-inspiring. To see more of our visit to Niagara Falls click HERE. Yesterday I got a demonstration of how creative my bride can be. Friday night, about the time we were thinking about going to bed, we suddenly lost all power in our computer room. At first we thought we had lost all power, but we then realized that electrical appliances in other rooms were working, so we knew that something else was wrong. I went out to the garage and checked the electrical panel and discovered that the circuit breaker for the computer room was off. I turned it back on and it promptly went off again. Definitely not good! Yesterday (Saturday) morning Betsy got up at her usual early hour to put out her bird feed. Since I’m such a nice guy I asked her if she wanted some help, but she said ‘No’. I dozed off and on for a while, wondering why Betsy didn’t come back to bed. My curiosity finally got the better of me and I got up to be greeted by a surprise — my bride had gathered up just about every extension cord we owned and strung them across the house. The living room looked a little strange, but the computers worked. The electrician will be here Monday and hopefully find and fix the problem. But in the meantime we’re online, thanks to my creative bride. The handsome young man above is my grandson, Sean. Sean is five years young and lives down in Florida. That means we don’t get to see him nearly as much as we would like to. Sean recently (November 5) had a birthday and Betsy and I were faced with the decision of trying to decide what to get a 5-year old. The last time he was up here he wanted to go shopping in a toy store here in Crossville, so we decided to get him a gift card to Toys ‘R Us and let him do his own shopping. Sean is a very computer literate young man, so he downloaded a thank you card which he colored and had his Dad send to us. (Dad may have had to help with the download, but if so Sean isn’t admitting that!). He also said he was going to have another birthday next week! I certainly have a smart grandson, but I would imagine that he will be less likely to want birthdays come so fast when he gets closer to my age!! One more thing: I’m sure you’ll agree that Sean is quite handsome. 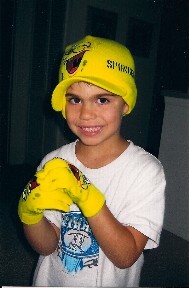 Fortunately he gets his looks from his father and not his grandfather! One of the bloggers Betsy told me about is a woman from Michigan named Shelley. Shelley actually writes three different blogs and maintains another site. She talks about living in northern Michigan and has some great pictures as well. I’m sure many people have entered this giveaway, but I’m really hoping that I win. In my younger days (before I had to worry about high cholesterol and things like that) I used to make sour dough bread for my family. 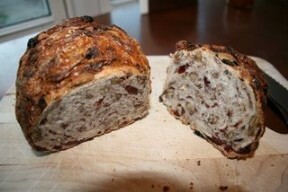 Although I stay away from breads more than I used to, I still love the smell of fresh-baked bread. If I win Shelley’s giveaway I promise to do justice to the prize! To see Shelley’s blog (and enter the giveaway) click on BUILDING A LOG CABIN. Links to her other blogs can be found on the right side of her page.